Debris surrounded a Goodwill donation station in Moore, Okla., after a powerful tornado ripped through the area on May 20. 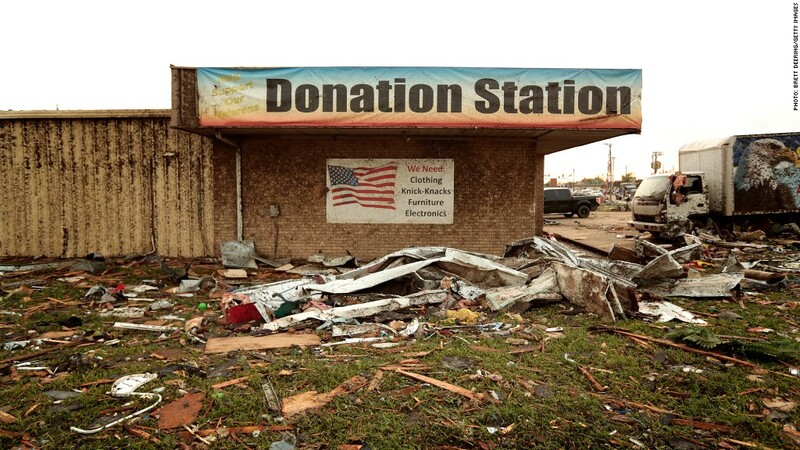 It's common for companies to make big cash donations after a disaster. But following Monday's tornado in Oklahoma City, several firms are going beyond writing a check, offering help through the use of their equipment, staff, buildings and other in-kind donations. At Chesapeake Energy (CHK), one of the city's homegrown oil and gas firms, one crane and two front-end loaders -- the kind of heavy machinery normally used to assemble drilling rigs -- are being used to help clear rubble from the disaster. They're being manned by Chesapeake employees, working on the company's dime. "Our equipment is designed to work in very austere conditions, and our people are trained for this," said James Pratt, head of emergency response at Chesapeake. "We get called quite regularly to assist in these large events." Chesapeake has also provided about a dozen generator-powered flood lights for the rescue operations. On Tuesday, the company sent trucks up to a distributor in Wichita, Kansas, that normally supplies its workers with gear such as leather gloves, hard hats and safety glasses. It bought every item the distributor had in stock, and plans to distribute them throughout the affected neighborhoods when people can finally return to sift through whatever is left of their homes. Throughout Oklahoma City, dozens of businesses have stepped up, offering goods and services to help with the relief effort, according to the local Chamber of Commerce. Verizon (VZ) set up a mobile command center and is offering emergency phones and charging stations. A LaQuinta Inn just west of downtown is giving free rooms to those without a home. The Home Depot (HD) in Moore, ground zero for the destruction, is now a shelter for homeless pets. A local branch of T&W Tire has had up to a dozen service trucks in and around the disaster area, offering free fixes for relief vehicles with tires damaged from all the debris. As of Tuesday morning, the trucks had fixed more than 150 vehicles. "These emergency responders are working their tails off over there," said Steve Theissen, a managing partner at T&W. "We need to help keep them going." The efforts extend beyond the business community. The University of Oklahoma housed more than a hundred people Monday night in its dorms, and is serving free food as well. Laptops are set up at the University's headquarters, a nurse is available to treat light injuries, and activities are being run to keep children entertained. "This is just part of being from Oklahoma," said one local resident, noting that the community's tradition of generosity in times of emergency extends at least as far back the Oklahoma City federal building bombing in 1995. "It's become known as the Oklahoma Standard."